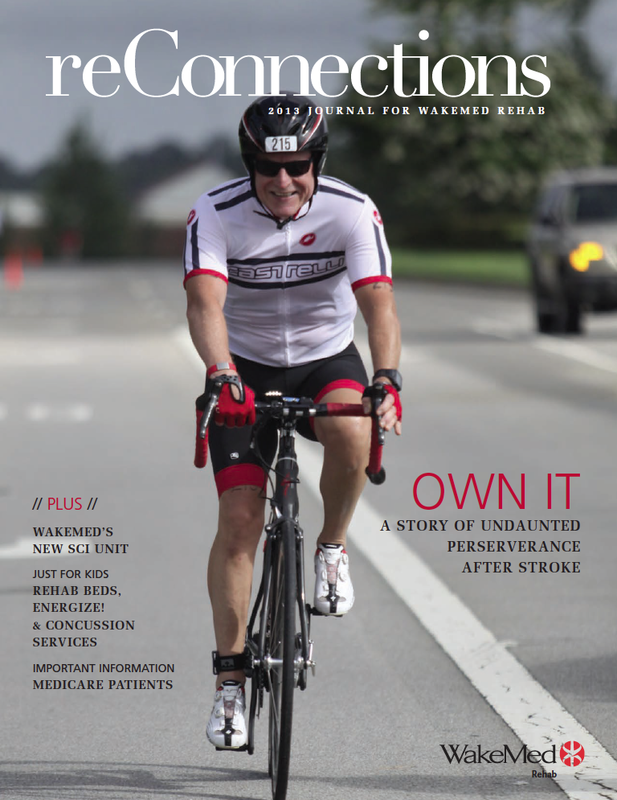 Bob Butler on the cover of WakeMed’s ReConnections 2013 magazine showing him competing in a triathlon one year after his stroke. The bike has been modified to shift and brake using only the left hand. NOTE: This was first published in ReConnections 2013 Journal for WakeMed Rehab – Written by Rebecca G. Scolio, Senior Specialist, WakeMed Public Relations. Beth Rudisill, MHA, LCSW, CCM, director, WakeMed Rehabilitation Hospital, made this statement during a recent interview with former patient Bob Butler. It’s a statement that more than hits home for Bob. 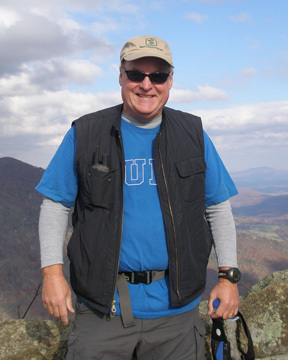 But, by taking ownership of his recovery, Bob is conquering the effects of his stroke. At age 59, Bob was an American success story. He was at the peak of his career and in the best health of his life. He had left his position as a chief operating officer of a global technology company to become a successful technology entrepreneur whose start-up ventures have created nearly 500 new top-paying jobs in Cary. Bob was a nationally ranked triathlete, loved to wakeboard at his lake home and is married to an amazing woman. Bob worked with some of the greatest business minds and technology leaders in the world to bring new ideas to the marketplace and has even testified before the US Congress and at the White House. Much of that changed in May 2012. Bob went to bed and suffered an ischemic stroke in his sleep. Because the time of the stroke could not be determined, he was not a candidate for tissue plasminogen activator (tPA) administration, which can decrease the severity of stroke – the reason it is critical to call 911 at the first sign of a stroke. Once medically stabilized, Bob found himself in a hospital room unable to talk, swallow or move anything on his right side (he was right-handed). That’s when the proverbial leveling of the playing field became very real. The short-term brain swelling that accompanies stroke made Bob feel like he was hit by a train. His mind dulled by a concussion-like haze and his right side paralyzed, Bob joined the ranks of the approximately 795,000 Americans who suffer a stroke each year. Not his business connections, financial stature or even his wife, an accomplished physical therapist and former department head of a 200-bed rehabilitation hospital, could restore his stroke-ravaged body and mind. “In a life dominated by successfully overcoming huge odds, for the first time, I knew total despair; I had to scream just as loud as I could and as long as I could,” Bob said. Bob Butler 8 years before his stroke and just before he made his commitment to fitness and nutrition. It was during his time at WakeMed that Bob realized he had an unexpectedly long recovery ahead. And it is important to note that, though Bob’s health was excellent just before his stroke, he is no stranger to health issues. He struggled with obesity for many years and eventually conquered it after age 50. “I was obese since I was 10 years old,” explained Bob. “My peak weight was 250, when my goal weight is 170.” During his earlier years, he also had multiple injuries from accidents and had several heart issues including a congenital hole in his heart, atrial fibrillation (requiring three cardioversions) and, yes, open heart surgery for a “widow maker” artery blockage, all before he was 47. But after he turned 50, he put all that behind him with a new lifestyle focusing on fitness and nutrition. It’s been approximately one year since Bob suffered his stroke, and, while it’s likely his therapy team considers his progress highly inspiring, Bob is more critical of himself. “The goals supported by insurance and the government are being able to perform basic activities for daily living. I want to be ‘like it never even happened’ (with apologies to Servpro™ for using their tag line). I’m at about 60 percent of where I want to be.” Many stroke patients would be overjoyed to be as far along as Bob one year post stroke. The man who could barely speak, think or move a year ago now actively pursues new business projects with his pre-stroke mental sharpness and energy. He tirelessly researches ways to regain full use of his right hand, arm and leg. He now bicycles 20 miles and swims an hour three times a week on top of rigorous therapy sessions. He has completed his first triathlon since the stroke and even returned to wakeboarding! His experience has taught him some important lessons about himself and what it takes to make the best possible recovery. “Recovery from open heart surgery was so much easier than my stroke recovery,” a statement from Bob that may surprise readers. After his open heart surgery, Bob returned to work in 10 days. Very few of his coworkers even knew he had heart surgery. He thought his stroke recovery was going to be similar. After all, he was in excellent physical condition. But he couldn’t have been more wrong. 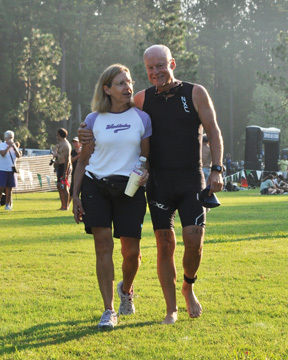 Bob and Karen Butler enjoy a quiet moment just before a triathlon the year before stroke. Part of taking ownership for your recovery is recognizing that it can take years, depending on your level of disability. Bob, who sets long- and short-term goals and projections for his business ventures, refers to his stroke recovery as a two- to three-year project. “As long as you keep working, you are going to keep recovering,” he said. You will have your frustrations along the way, but don’t give up. Trust that the work you put into your recovery will reward you in the future. “Patience and persistence are everything. It’s definitely a two.steps-forward-one-step-back process. Children will start to walk before age 2, but it will be several years before they have a smooth, natural walk. And they are not dealing with the unique stroke complications of building neuron connections, mitigating tone, addressing muscle atrophy and eliminating undesirable movement compensations,” explained Bob. Beginning to learn to walk again a month after the stroke. 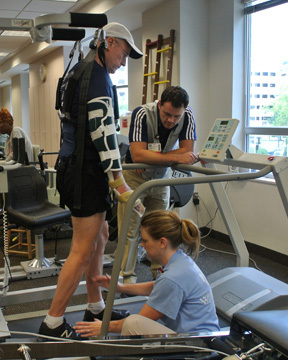 Bob Butler is suspended in a harness on a treadmill with the therapist having to facilitate each step at WakeMed Inpatient Rehab. Make it clear to your therapists that you are highly motivated to make the best possible recovery. “How you present yourself within the first 48 hours [of entering a rehabilitation facility or program] is a good indicator of how well you will do,” said Bob. “This is really hard to do at the time because your brain is swollen and you feel awful, but do it!” Therapists tailor their services according to the abilities, attitudes and motivation their patients demonstrate. Show them you are up for the challenges they have for you and, in turn, challenge them to reach beyond therapy standards and find new exercises to benefit you. Therapists will love you for it and they will deliver their best for you. Bob learned this lesson, even after a warning from Dr. Patrick O’Brien, medical director, WakeMed Rehabilitation Hospital. “He told me ‘Don’t go back to work too soon. You’ll need those mental reserves.’ I didn’t listen to him at first, and I paid the price,” he said. Bob now makes sure he gets enough rest and sleep. He is also back on his strict fitness diet because he believes recovering from a stroke is like any other athletic training. 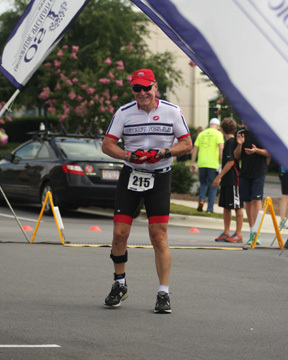 Crossing the Finish Line at the Garner Triathlon one year after the stroke. Note the AFO on his right leg and holding his arm to control spasticity. The most amazing thing is that Bob was not last across the finish line. Bob also emphasizes strategizing important commitments because “physical and mental performance are closely linked during stroke recovery”. On days when he has an important meeting or presentation, he will make it a priority and clear his schedule of other obligations to ensure he performs at an optimum level and doesn’t exhaust his reserves. Your health care providers can help you create your schedule and change it along the way as you progress. Bob believes stroke recovery is less about being a Type A personality and more about knowledge – knowledge that anyone can gain about what it is really going to take to get where you need to be. For some stroke patients, the therapies that are currently available can only take you so far. Bob credits his insatiable appetite for knowledge and his therapists’ willingness to think “outside the box” for much of his progress. Bob’s wife, Karen, shares his thirst for knowledge and continuously researches old and new treatments and techniques to help her husband reach peak recovery. Helping Bob has reignited her passion for helping severely affected patients recover, and she has even returned to her career roots as a physical therapist. Bob’s exceptional progress correlates directly with the significant commitment he has made to his recovery. He continues to own it every day.